Missed Part 1, Part 2, or Part 3? Given that our world is plagued by religious conflict and cruelties, some antitheists have suggested that religion as a whole is a form of pathology. But as worried and angry as we may feel about religious harms, here is a reason this way of construing religion doesn’t quite work: The term pathology implies illness and disability, and not all forms of religion appear to cause harm, even when they contain contagious ideas that are false. For antitheists, religion’s good side complicates the story. All of the world’s great religions fail the “outsider test of faith,” meaning they fail to meet any normal bar for credibility when scrutinized by an outsider applying the same rigorous standard of evidence to each. In their traditional forms, all contain rational and moral contradictions or factual inaccuracies that insiders can justify only with Olympic feats of mental and moral gymnastics. Many rely on sacred texts that reflect the precise combination of knowledge and ignorance that characterized the culture in which they were written. All make claims for which there is no proof and none possible. Even so, the harms done by religions vary, and in fact under the right combination of context, person and belief, religious practices appear to have benefits for individual practitioners and their communities if not our world. This seems to be true irrespective of their truth value. For example, religious involvement has been shown to help people cope with disasters and increase prosocial behavior toward insiders; and active participation in a religious group may prolong life expectancy. It is entirely possible that most or all religions were adaptive in their original form at the place they emerged, helping believers to outcompete nonbelievers or helping one tribe to outcompete another. Susan Blackmore argues that from a strictly evolutionary standpoint religions are adaptive even today in that religiosity increases the birthrate for adherents, especially those who are most devout. If that sounds noxious, we must remember that today’s context—with competing religious tribes wielding weapons of mass destruction on a global scale and promoting competitive breeding while humanity faces potential collapse—is a historical anomaly. Nobody really knows whether religion as a whole has done humanity more harm or good, but either way, research suggests that it benefits at least some people some of the time. At worst, then, religion produces some combination of harms and benefits, which tends not to be the case for pathogens. If religion sometimes helps people to thrive and produce more offspring; or psychologically, or if some religious fictions might be adaptive—it is easy to imagine, for example, that believing God loves me might aid depression or confer resilience—then religion as a whole can’t really be considered a socio-pathology. That doesn’t mean the analogy to microbiology fails altogether. It may still be useful to think of religion as a socially transmitted infection—or better said, to think of religions (plural) as a family of socially transmitted infections, only some of which are pathological. Not all socially transmitted infections are pathogens. Viruses that infect humans are almost universally harmful, but the same is not true for bacteria. Human beings play host to a wide variety of bacteria. Estimates suggest that 500 to 1000 different types live in our mouth and gut alone. These organisms exist as independent self replicators, meaning that whatever they do is designed to spread little copies of their own DNA, not ours. But some have evolved to help us out so that we will help them out. That is their reproductive strategy, just like the wheat and rice and corn we cultivate. In fact, they play such important roles that if they disappeared we would need to find something similar to replace them—and fast. Our relationship with any given type of bacterium may be symbiotic, meaning a mutually beneficial arrangement in which we help each other survive—like the little guys that live in our gut and eat our food waste. Alternately, the relationship may be adversarial—as in the parasitic bacteria that begin to eat our muscle tissue when we get a cut and must be killed off by antibodies or antibiotics to prevent sepsis. Some organisms may be perfectly capable of playing either role—eating either our waste or our bodies, depending on the circumstances. The spectrum of relationships that we have with the self-replicating bacteria we host may offer some insight into our relationship with self-replicating religious ideas that we also host. Religions have many shapes. 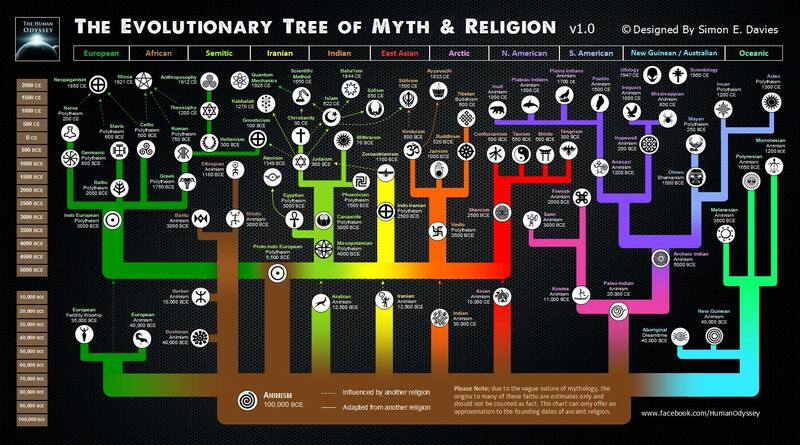 Religions don’t vary as much as micro-organisms, but they do vary dramatically, in part because they are constantly evolving. 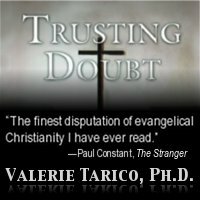 Since its founding, Christianity alone has branched into more than 30,000 different denominations and non-denominations, each persuaded that their understanding of God is slightly or substantially more true than the rest. Outside of Christianity, most people today ascribe to one of eleven or so major religions: Hinduism, Buddhism, Judaism, Islam, Confucianism, Taoism, Shinto, Jainism, Sikhism, and perhaps Zoroastrianism. That said, each of these might better be thought of as a family of religions, much the way that influenza should really be thought of as a family of related viruses: bird flu, swine flu, 1918 epidemic flu, seasonal Type A flu, and so forth. Outside of these major families of religions, lie many others—indigenous religions, for example, and new religious movements. And this doesn’t count the thousands of religions that once lived in human minds but have now gone extinct. All of this variability creates increases the likelihood that some religious memes are symbiotic while others parasitic—and that the package of ideas espoused by any given church or individual might include some of both. Asking whether religion broadly is harmful or beneficial may be as silly as asking the same question about bacteria. It just is, whether we like it or not. And yet we know beyond a shadow of a doubt that some religions are doing tremendous harm in our world. At the individual level, religious beliefs and edicts cause immeasurable suffering in the lives of individual people around the world, disproportionately affecting the most vulnerable among us—women, children, the desperate and the poor. At the collective level, religion’s mutually-exclusive truth claims and tendency to promote tribalism may jeopardize our very existence. To move toward a better future, humanity must take on the challenge of reducing religious harms, and that means we need to understand what we are up against. Fortunately, we have a whole new set of tools for the job. After millennia of enforced deference, scholars recently have begun studying religion as a natural phenomenon, applying standard methods in sociology, psychology, anthropology and neurology to answer questions about what religion is and how it gets transmitted. An economist now may analyze a religion as an economic system in which adherents trade present time and resources for afterlife goods and services. A political scientist may analyze it as a set of social institutions that create order and group identity. A historian of science may examine it as a system of proto-science that once provided explanations for natural phenomena and events. Among all these fields of study, the scholarship that most transforms our understanding of religion may come from the burgeoning field of neuroscience. The answers aren’t all in, not by a long shot. But if you want some teasers, Pascal Boyer (Religion Explained) examines how religion fits the structure of human information processing. Psychiatrist Andy Thomson (Why We Believe in Gods) has described how religion taps normal mechanisms of child development and relationship. Neurologist Robert Burton (On Being Certain) discusses in lay terms why people so often feel utterly convinced that something is true when it isn’t. What makes some religion so compelling that people risk their lives in the Amazon jungle, or stand preaching on street corners, or maneuver their way into public grade schools, or even wage Jihad to spread their beliefs? How does religion prompt people to do things they otherwise would find odious or immoral? What kinds of ideas are most “sticky” and likely to get passed on? Why are some particularly robust in the face of contradictory evidence? What is the process by which once unassailable beliefs crumble? The answers lie somewhere in the shape of the human mind and the complementary shape of viral ideas that take up residence there. But to answer broad questions like these, we probably will need to break them into smaller ones like Under what circumstances? For whom? To what degree? Interestingly, the word pathological itself offers at least one clue about where we might direct inquiry about religious harms. Pathological has two meanings. The first relates to disease or ill health. But the second focuses on obsession and compulsion, as in “a pathological liar.” Perhaps the level of socio-pathology caused by a religious meme or meme complex depends, at least in part, on the degree to which it leverages compulsion as part of its reproductive strategy. Religious compulsion might refer to the level of threat and fear a religion uses to win and keep converts, or the degree of obsessive thought and compulsive behavior it engenders in believers. But compulsion is likely to be just one part of the picture, because the experience of many religious believers is that they practice their faith freely and happily—even when this may seem dubious to outsiders. The answers, in other words, won’t be simple. Reaching the point that we understand religion well enough to head off some of its worst manifestations may be a daunting challenge. But given our interconnected world and enormous destructive capacity, we are approaching a religious crisis that we can ill afford to ignore. Beyond this urgent threat, though, lies uncharted terrain that captures the imagination. Can we consciously evolve humanity’s religious ideas and create new strains that might help us flourish and live in community with each other? Like the future of biological evolution, the future of spiritual evolution may lie in our hands. Part 4 in a 4-part series. This series was abridged as a single article in The Humanist – A magazine of critical inquiry and social concern. May/June 2017 issue, p. 16-21. Gallery | This entry was posted in Cognitive Science and Christianity, Uncategorized and tagged memetics, psychology of Christianity, psychology of religion, viral ideas. Bookmark the permalink. 14 Responses to Can Bacteria Help Us Understand Religion? Part 4: Religion – Symbiote or Parasite? With this part, you come closest in this series to answering my initial question although you’re still rather a ways from doing so. But let me throw in something else: aside from Judaism and Christianity, have any other religions we know about concluded that slavery, which has existed as long as has civilization, is simply morally wrong? You may say that this all comes from the Enlightenment. Well, Val, every intellectual movement has underpinnings and roots. Are those of the Enlightenment in this respect anything else besides Jewish and/or Christian? If you point to pre-Christian Classical wisdom, I may laugh so hard that I wet myself! Surely you know that those societies were BUILT on slavery?! I think the ‘good’ of religion is something you will need to get into to a much greater extent than I’ve yet read in your posts–so, happy hunting! Um, since when did Christianity or Judaism conclude slavery is simply morally wrong? Scripture is silent to condoning on slavery. Up until the civil war scripture was used both to justify and repudiate slavery. Slavery is a social construct based upon socio-economic interactions. It was constructed for class war and for the “other.” Basically the premise was some people are or become subhuman and are to be treated as such. Christianity and Judaism as well as Islam utilize the “other” as well and as such non-, different believers become heretics, infidels or goy. And as such they can be treated in any manner. What stopped slavery here and in some other parts of the world was the secular state. Slavery? You’re crediting Christianity with ending slavery? The first formal abolition of slavery was enacted in India, by Ashoka, emperor of the Maurya Dynasty, who abolished slavery in the 3rd Century BCE. In China, the Qin Dynasty eliminated slaves in the late 200’s BCE. When the Qin Dynasty fell, many of these laws were overturned, only to be abolished once again in 26 BCE by Wang Mang (Xin Dynasty) who abolished slavery altogether. In Europe, the first abolition of slavery occurred in Venice, 960 CE, when the Magistrate (Doge) of Venice, Pietro IV Candiano, banned it. Doge’s were men of the Law, not of religion. Venice was, of course, antagonistic to the Vatican. It was not until 1102 when we see the church in London condemn slavery during the Council of London . Slavery, however, was not banned in the UK until the legal case, Somerset v Stewart (1772). I am interested in the tools and mechanisms of Christianity (religion). It seems religion is so successful, because of it’s “infectous” nature, and it’s ability to manipulate people to do its bidding. Is there a body of evidence, books, articles on the way Christianity recruits, binds, and employs its “army” of Christian warriors to achieve its religious and political goals in culture? I refer to concepts like Heaven and Hell (rewards and punishments), praying (reinforcement), weekly sermons (framing), FAITH (suspension or rejection of some or all of reality), confusing scripture, sociallization (church attendance), peer pressure, guilt (through the Christian idea of “sin.”), etc. In my estimation, the virulent manipulation of large numbers of people (even though the number of denominations is large, and the meme is diffuse) through core tools, makes organized religion a dangerous intruder into our secular lives and government. I do not necessarily dis-believe in a god. I believe this idea or relationship shoud be strictly personal. Thanks for a very thought provoking series of articles. They have even spurred me to be a little less absolute in my opposition to religion. I’ll make even more effort to be more precise in the ideas I find damaging in religion. Valerie have you checked out https://evolution-institute.org/? I am sure you would find pertinent to what you ae saying here. I would like to find out when was the first mention of christianity/Jesus that we know of, where and by whom. Thank you. Re “The term pathology implies illness and disability, and not all forms of religion appear to cause harm, even when they contain contagious ideas that are false.” There is harm in the form of opportunity cost, the cost of what you could not do because you participated in religious activities. Of course, that time and money could be spent on unproductive activities, too, but it is still real. I think your argument is a common one. I’ve heard it before. But, what if organized religion was somehow eliminated or reduced? I believe people, being social beings, would find other social outlets to achieve essentially the same, or better social and personal benefits you describe, without the supernatural factor that leads to suspension of logic and rational thinking through manipulation. I think the benefits of reducing organized religion are far greater than simply providing social outlets for anxiety, mutual interaction. The battle is for the full spectrum of connected mindful thinking people, where creativity, rational thinking and freedom from religious coercion lead to a synergistic effect that benefits many more people. One of the most potent tools of the Christianity meme’s subversion of the memetic immune system is the saying “Satan can quote scripture for his own ends”. It is common knowledge among the thoughtful that the average atheist knows the bible better than the average christian, but if the atheist uses a biblical quote to make a point about a contradiction or inconsistency, the believer can pull out this little ditty and even the most logical of arguments will bounce off and cognitive dissonance can be maintained. This is one of the ways chronic carriers may remain healthy but still transmit the meme/virus, This can be considered analogous to getting a flu shot after symptoms have already appeared. For some, the memetic infection is chronic and terminal.